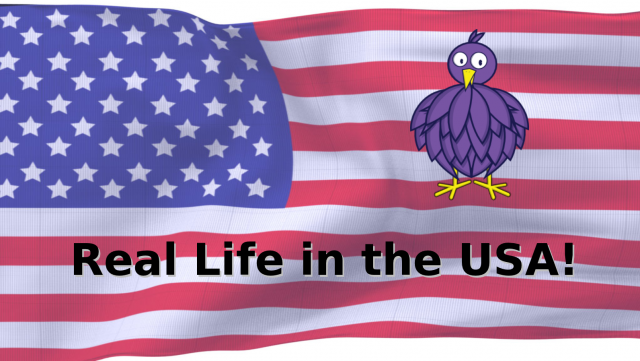 After eight weeks of really intense work, we've finally launched "Real Life in the USA" - a paid package of texts for Bibliobird, designed to help Poles learn English while simultaneously learning about the USA. While everyone in the world is familiar with American movies and TV shows, these representations aren't 100% accurate! However, this is unfortunately how most foreigners form their impressions of the USA, Americans and our culture. "Real Life in the USA" contains informative articles, fictional stories, interviews and natural conversations with native speakers, covering many topics from everyday life, including: work, education, crime, finding an apartment and many others (read more for the full table of contents!) - all through the eyes of real Americans! These texts are in English, all include audio (some of it taken from authentic conversations!) and are prepared to be read using Bibliobird, a web application based on the method I used to learn Polish! Read more for the details and information about getting a discount! Vlog: Shaving off my beard! Like I said: if we reached 200% of our goal on PolakPotrafi.pl, I'd shave off my beard. And I did it! I started a page on Bibliobird with the official "thank yous" but unfortunately, more than half of the supporters still haven't responded to Karolina's e-mail! You need to respond in order to get your "thank you", postcard or badge on your profile. This video was a lot of fun to record! The very beginning and ending are in Polish but the rest is in English because this is the language that my wife and I usually interact in. Please let me know what you think of me without my beard in the comments! Two weeks ago, we began the presale of our first paid product on PolakPotrafi.pl. We were able to acheive our original goal of 10.000 PLN (about $2900) in only two days! There's one more week left in our project and (as I said a bit ago) I'm adding a new goal: If we reach 200% or 20.000 PLN (about $5800) by 2012-07-16, I'll shave off my beard. We already have 154%! The video is in Polish but there are English subtitles (click the "CC" on the bottom right). I recommend it! My wife and I had a lot of fun recording this one. Here is our project page on PolakPotrafi.pl. If you want to contribute, but don't speak Polish - check out this video. Rekordowy projekt - "Język angielski z prawdziwego życia"
Read more for the transcript! Presale at 94%! More opportunities to become a founding member! Thanks everyone for your support! This has been amazing! In general, I didn't expect the presale on PolakPotrafi would go so well. :-) I also didn't think that the option to become a "founding member" would be so popular! I ran a survey a couple weeks ago and I came to the conclusion that the package itself, "Real Life in the USA," would be the most popular and would make the most money. However, it turned out to be the complete opposite! The first 20 places to become a founder were bought up within 5 hours of the official start. :-) When I added more, those were bought up in less than a day. I know that if I add more new, they will also be bought very quickly. And the extra money would certainly help us start out! Unfortunately, when I added more places last time, a few people in the first group were unhappy, because it was supposed to be an exclusive group. They were first so they got the best deal. In a sense it's unfair that the later people got the same deal. I understand that perfectly. So, when I again add more opporutunities, the people in the first and second groups must get something special. Like I said a few times in the comments and in an update on PolakPotrafi, I seriously cosidered making the price higher for the new people. But after lots of thinking, I decided that maybe that wasn't the best idea. I don't want to create bad relations in the future between the people in the first two groups and the people in last. Afterall, the people in the third group would pay more (and in a way support the project more), so why should they have a lower status among the founding members? That would also be unfair. After the presale we aren't ever going to sell founding memberships again - it wouldn't make sense. We'll have to concentrate on creating and selling the products themselves. However, I think that even 100 founding members would be OK. Looking at the data, if I don't add any new places, will get to 10.000 PLN ($2900) in a week and in the end only a little higher. But if I add some more opportunities to become a founding member, we have a chance to even get twice that! That's why this decision was so hard but also important. Read more to find out what it is! Or visit our page on PolakPotrafi to become a founding member! I can't believe our presale is finally happening! Back in January, I decided that I was going to try to turn my hobby of helping people learn languages into my job. And I had to give up a lot to do it. We have until 2012-07-16 in order to raise enough money to create the product. If we don't, all the money will be refunded and we won't create it. But if the presale of our first paid product is a success, my wife and I will finally acheive our dream! We're conducting the presale on a Polish crowdfunding website called PolakPotrafi.pl (click here to see our page there). I chose this site because it has the best payment options for Poles and allows project descriptions in Polish. This makes sense because the first product is aimed at Polish native speakers learning English and they make up the majority of my readers and fans. But there are plenty of reasons to get involved in the presale even if you aren't Polish or aren't learning English! For 20 PLN (about $6) you can get a postcard from the USA. For 100 PLN (about $30) you can get access to an exclusive webinar and Q&A session that I'll do about learning a language on your own. I'll do it twice: once in English and once in Polish. Or maybe you thought my free ebook was useful and just want to give something to thank me! Click here (in Polish!) to learn more or to help us either financially or by spreading the word! Thanks so much! If you don't speak Polish, click the "Read more" link to see a video I made to show you how to contribute. Two weeks ago I told you about our idea for a paid language learning product. There was a survey about the price and format for this product. A few hundred people filled out the form - thanks so much! Last week I told the results of the survey and asked for ideas for the topic of the product. There will be texts (and films with transcripts!) about many aspects of life in the USA, for example: work, fun and sport, and other daily activities. There will be normal articles as well as stories and dialogs! Some of the materials will be taken directly from real conversations with native speakers. We'll also talk about immigration, stereotypes and music. Everything will be in English, with native speakers and prepared to be read, watched and listened to on Bibliobird! I will publish more information on Monday! Thanks in advance for your support! BiblioBird is a web application for learning languages that I designed based on my experiences learning Polish. Until now, BiblioBird has been a personal project of mine - but I have much bigger dreams for it! I want BiblioBird to become a community project in which anyone can participate, similar to Wikipedia, for example. To facilitate this, I've recently released the code that powers BiblioBird as Open Source. I am now working on some new features that will facilitate contribution from the new community! Read more to learn about BiblioBird and what I hope it could become! Vlog: Pomóżcie mi tworzyć wolny serwis do nauki języków! Zwracam się do Was o pomoc z BiblioBirdem! Konkretnie z testowaniem nowych funkcji. Proszę dołącz do zespołu BETA! Oto jest wątek na forum dla programisty.